Former Chelsea star and Derby County coach Frank Lampard has revealed what José Mourinho told him yesterday after beating Manchester United in the Carabao Cup. Derby won 8-11 on penalties at Old Trafford after the first leg of the third round ended in 2-2 in 90 minutes. The Red Devils seemed to be heading for victory after Juan Mata scored a nice goal three minutes later. But Lampard's men equalized at half-time when Harry Wilson parried a spectacular free-kick for Sergio Romero. Mourinho was frustrated at the end of the game, but Lampard revealed he was modest in congratulating Derby's performance. 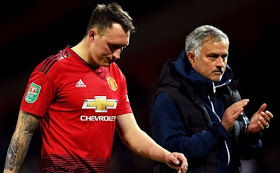 "He [Mourinho] said what a great performance the team of [Derby] did, I appreciate that because it's not easy to get a defeat at the last moment." Metro UK quoted him. "I think he said that before the punishment, but I appreciate it. "Jose was altogether very hospitable, we obviously know each other, and he came and spoke to me first, we talked during and after. "It was an honor for me to compete against him." Lampard continued, "I try to build a group to be successful and nights like these are incredible. "To play and play against world-class players is right up there. "Getting into Old Trafford early and playing as well as she did was great, we had the personality to take fines and play as we do."